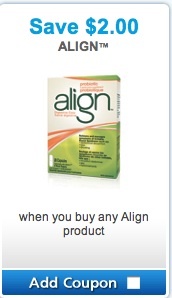 Align coupon is a mailable coupon at Brandsaver.ca. Visit Brandsaver, select the Align coupon, create an account and claim your coupons. All coupons are free and mailed for free from Brandsaver. You must select between 4-32 coupons to be able to proceed with your order. 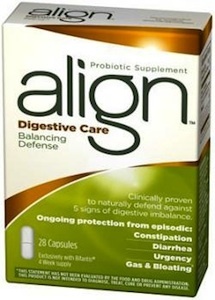 This is an Align coupon to save $2 on Align Probiotic Digestive care products. Align coupon is valid only in Canada. You can find Align products in any drugstore, Rexall, Shoppers Drugmart and more. Align is a dietary supplement that comes in an easy-to-swallow capsule that you take just once a day, each day, to help maintain your digestive balance. When taken daily, Align naturally helps fortify your digestive system with healthy bacteria 24/7. For best results, take Align daily as a part of your healthy lifestyle.